The university needed a reliable, energy-saving backup solution for its computer centre. Eaton 9395 2x1100 kVA with ESS technology. 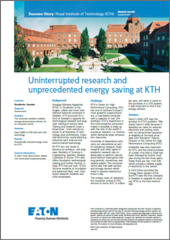 Dramatically reduced energy costs for KTH. KTH`s Center for High Performance Computing, PDC, has one of northern Europe`s most powerful supercomputers, a Cray-based computer with a capacity of over 305 teraflops. KTH`s investment in the most powerful computers makes it possible to keep up with the rest of the world in e-science research, i.e. science which demands large computation resources. Hundreds of researchers who carry out calculations as part of turbulence research, brain research and other types of academic research rely on being able to perform calculations without interruption over long periods, sometimes over several weeks. The computer centre also has web servers and storage servers which need to operate twenty-four hours a day.